Jasmin Fisher is a Principal Researcher at Microsoft Research Cambridge in the Programming Principles & Tools group. 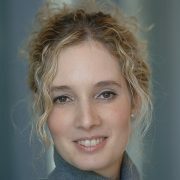 She is also an Associate Professor of Systems Biology in the Department of Biochemistry at the University of Cambridge. She is a member of the Cancer Research UK Cambridge Centre, Cambridge Systems Biology Centre and the Wellcome Trust-MRC Cambridge Stem Cell Institute. In 2016 she was elected Fellow of Trinity Hall, Cambridge. In 2017 Jasmin was named one of the Top Outstanding Female Leaders in the UK Healthcare by BioBeat. In 2018 she was elected Fellow of the Royal Society of Biology. Jasmin received her Ph.D. in Neuroimmunology from the Weizmann Institute of Science in 2003. She then started her work on the application of formal methods to biology as a postdoctoral fellow in the Department of Computer Science at the Weizmann Institute, and then continued to work on the development of novel formalisms and tools that are specifically-tailored for modelling biological processes in the School of Computer Science at the EPFL in Switzerland. In 2007, Jasmin joined the Microsoft Research Lab in Cambridge. In 2009, she was also appointed a Research Group Leader in the University of Cambridge. Jasmin has devoted her career to develop methods for Executable Biology. She is a pioneer in using formal verification methods to analyse mechanistic models of cellular processes and disease. Her research group focuses on the development of computational models to study the molecular mechanisms of cancer in order to identify new treatments for cancer patients. Our research focuses on the design and analysis of executable computer programs describing biological phenomena, an innovative approach called Executable Biology. This approach enables us to use powerful methods developed in computer science and software engineering to analyse programs to gain better understanding of the innate complexities observed in evolving biological systems and how they make decisions. Over the years these kinds of executable biology programs have repeatedly shown to drive new discoveries in a wide variety of biological systems. Once an executable model of a biological system has been built, it can then be used to get a global dynamic picture of how the system responds to various perturbations. In addition, preliminary studies can be quickly simulated on the model, saving valuable laboratory time and resources for only the most promising avenues. The use of executable biology models to determine the molecular mechanisms controlling cell fate decisions (how cells make decisions to develop into a particular cell type) during normal development (e.g., our work on blood stem cells development) and cancer (e.g., our work on regulation of leukemic blood stem cells, glioblastoma, breast cancer), as well as to identify novel combination therapies in malignancies (e.g., our work on CML, AML). The design of formal languages and tools for systems-level modelling and analysis of biology (e.g., bounded-asynchrony, synthesis algorithms for gene regulatory networks). We put a lot of emphasis on constructing user-friendly tools (i.e., visual, flexible), in order to facilitate the integration of such computational tools as mainstream techniques in biological and medical research (e.g., Bio Model Analyzer). Lineage Simulation Tool – Coming Soon!